Home › Dating Advice for Women › Dating with Children in the Picture: Where do you meet kid friendly people? Dating with Children in the Picture: Where do you meet kid friendly people? This is one of the relationship questions I hear a lot. Especially if you have children, it’s important to meet someone for a serious relationship who is “kid friendly”. These are people who like being around children, see them as a blessing and not as an annoyance. Also, if you are a single person without children and want children in your life (and may not be able to have your own children at this stage of your life) where would you more likely meet single parents for dating? Believe it or not, it is easier for this group to meet single parents. There are single parent groups like Parents without Partners (www.pwp.org) and other local single parent groups. I know one man who never married and he went to their meetings in search of a single mother! Now with www.meetup.com you can sign up for a single parent group. You can find a group in your area. I know there are several DC groups that are specifically for single parents. You can find them on www.DCDatingInfo.com. Of course there are online dating sites that cater to single parents like www.singleparentmatch.com. Again, it’s important to be upfront about that you love children and would welcome to be part of a family. Another offline place to meet people who love children is volunteer organizations focusing on children like the Make a Wish foundation or Special Olympics. If you get involved with one of these organizations I am sure that you will meet some single parents (or singles) who adore children. If you don’t have children, it’s important to put yourself where single parents may be. How about teaching a Sunday school class? You are sure to find the single mothers and fathers who share your same religious affiliation! Now that the weather is getting nice, you can go to the zoo, to a local park, or the local pool and meet single mothers and fathers who are taking care of their children on the weekends. My last piece of dating advice is to work part time (on the weekends) at a local independent toy store. You are surely to meet some single parents there! How have you been successful in meeting kid friendly people? I’d love to see your suggestions. What qualities are you looking for in a love relationship if you are a single parent? P.S. 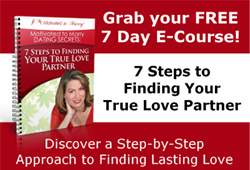 Get your relationship questions answered! Subscribe to my emails to get helpful dating and relationship advice and tips to move you forward towards your goal of meeting a partner for a committed serious relationship or to enhance your existing love relationships at www.heartmindconnection.com. You can sign up for my next tele-gathering there. Also, you can download a free chapter of relationship advice from my book, Get It Right This Time-How to Find and Keep Your Ideal Romantic Relationship at www.GetItRightThisTime.com. ‹ Dating with Children in the Picture: How important in marital status?